Welcome To Marysvale and the Pauite ATV Trail - The Original Information Source. Please take a minute and fill out our Utah visitors survey. Home of South-Central Utah's 900+ mile Paiute ATV Trail System, a trail system with no beginning and no end, making it the largest in the nation! It passes through multiple towns and has side trails leading to others. Dirt Wheels magazine rated the Paiute ATV Trail as one of the top 10 trail systems in the country. It has been rated as one of the top 5 trails in the country by ATV Illustrated magazine. Many riders consider the Paiute Trial to be the TOP US trail system. The main #01 loop trail is 238 miles long, with over 800+ miles of marked side trails and 1900+ miles of additional accessible side forest roads and trails, so we suggest that you do it in segments. Best estimates are that just the #01 loop would take 25 hours to ride just this section, without much time for pictures or anything else. With the many side trips and access roads into towns around the trail system the number of miles you can travel adds up to be considerably more than 2800+ miles of trails and routes. Unless your tush is made of some of the hard minerals mined from our surrounding mountains, you can travel an average of 60-70 miles a day comfortably on an ATV. For more detailed information on the Paiute ATV Trail we have published the Paiute ATV Trail Guide Book with detailed descriptions about it and it's many sections. You can order it here on our web site. The Paiute ATV Trail is also home to one of the best UTV Jamboree in the nation. The Paiute UTV Jamboree, held each August in Marysvale Utah, is a MUST DO event. So come on out and enjoy the Jamboree. Get your FREE PAIUTE ATV TRAIL RIDE COUPON HERE! To ride the trail is actually Free but I thought we had to give away something! The businesses listed here on www.marysvale.org are extremely supportive of the Paiute Trails and I highly recommend you and everyone support them. If you do not see a business you have heard of listed here, you might reconsider your options and spend your money with one who is. We are no longer limiting the listings to just Marysvale business owners. 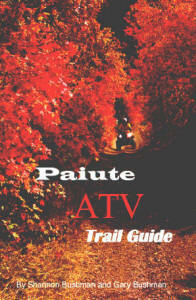 We are now taking orders for the all NEW "Paiute ATV Trail Guide Book". Page after page of detailed information on the Paiute ATV Trails. Photos, Maps, GPS Data for every intersection and point of interest on the trail, Tip and Tricks for riding the Paiute ATV Trails. Divided into the major sections of this mammoth trail system and includes information on how to access the trails from each community surrounding the trail system and much more. Item Name: Paiute ATV Trail, #708 Trails Illustrated Map and Paiute ATV Trail Guide Book Combo pack. Price: $69.90 plus shipping and handling. We accept the following credit cards online. If you eat, sleep, walk and talk ATVs and Utah then you've come to the right place! ATVUtah.com was built as a way for ATV enthusiasts to get the latest and greatest information on ATV riding in Utah. "The Paiute ATV Trail Topographical Guide Maps." Created using the National Geographic's Topo!® software. This is the highest detail level map available for Utah's World Famous Paiute ATV Trail.